Home > DIY How To Projects and Tutorial Guides > Understanding the Balustrades, Handrails and Spindles on a Staircase – What is the Right Jargon to Describe the Banisters for Your Stairs, What do They do and What are Your Options? 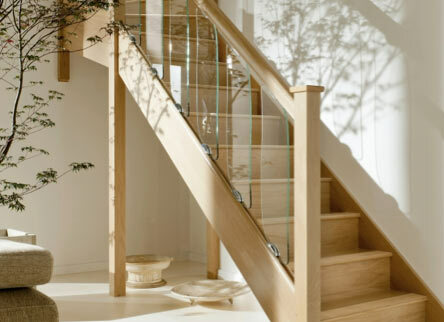 Understanding the Balustrades, Handrails and Spindles on a Staircase – What is the Right Jargon to Describe the Banisters for Your Stairs, What do They do and What are Your Options? Learn about the terminology to describe the handrails and banisters for your stairs, so you can ensure that you are getting what you want. We will cover the different kinds of design for handrails and balustrades so that you understand what is available and how they are constructed. 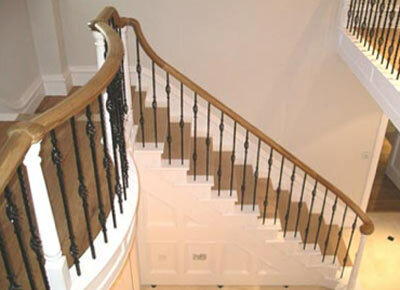 By knowing your staircase and balustrade types you will be able to clearly explain what you want in your own home. We will cover some of the more common styling options that are available for your handrails. There is a lot of technical terminology that is used in the making and describing of staircases and their handrails, or balustrades as the complete handrail and supports are known. We cover the parts of a stair case in greater detail in another project; here we are focusing on the handrails, banister and balustrades for stairs – which ever term that you prefer to use. We have a range of projects on jobs that you can do on the stairs, from painting to carpeting. We cover lots of trade tips to get over the difficulties of working on the stairs. The balustrade is the term generally used to describe all the parts of the stair case designed to keep people on the stairs. 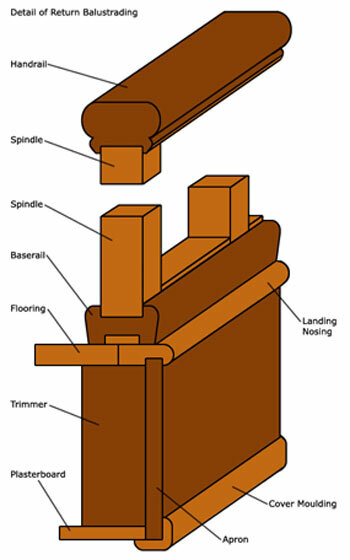 It includes the handrails or banisters, the stair spindles (or balusters), newels and their caps. 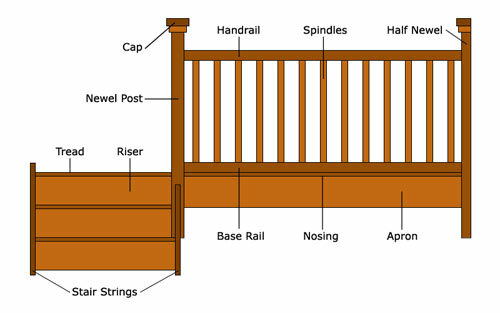 Sometimes people can refer to this as the banister or the railings/rail system, although these terms are more generally limited to the rail, spindles and base rail. Just like stairs, the balustrade can be made of many different materials. The most common choice in a domestic setting is wood, but often stone, metal and glass are used. Quite a striking effect can be achieved by mixing different materials to create a unique balustrade. This the railing at the top of the balustrade that runs between and is supported by the newel posts. 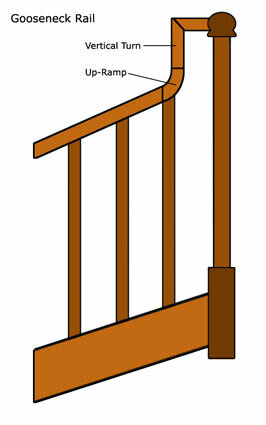 The term banister is often used to include the stair spindles as well. It is for used as a handhold, and the minimum height allows is 900mm (see the regulations below). The handrail is supported by the newels. It can either pass over then as a continuous rail or more commonly it can fix to each newel post, where the newel sits between the rails breaking them up. This is known as post–to-post. 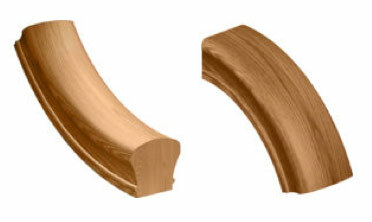 In some instances the handrail might have an inner metal core to provide strength, and to assist if the rail is curved, particularly against the grain. In North America this is referred to as the Baluster, but the term is beginning to creep over to the UK, probably as people read about it on the internet. These are the decorative uprights that run between the handrail and the base rail or the tread of the step. They are designed to stop people and other objects falling off the stairs below the handrail. They do not hold the handrail up; the structural support for the handrail is provided by the newel posts, but they will provide some limited support. This is the rail that runs at the bottom of the spindles, supporting them. It sits on the string (or stringer), which is the diagonal section at the side on the stairs which supports the steps. We have more information about stair case terminology if we are losing you! There are groves cut into the base rail so that it can be fixed to the string and then the spindles into it. If the staircase has an open or cut string design there is no base rail and the spindles are fixed directly to the tread of the step. This means that alternate spindles will be different lengths, so this needs to be incorporated in the spindle design. We will cover the spindle design options in further details below. When making stairs outside, base rails with a grove are seldom used as the grove for the spindle will allow water to enter and collect. This will cause damage and rot. In this situation the spindles are fixed to the base rail using screws or dowel joints. 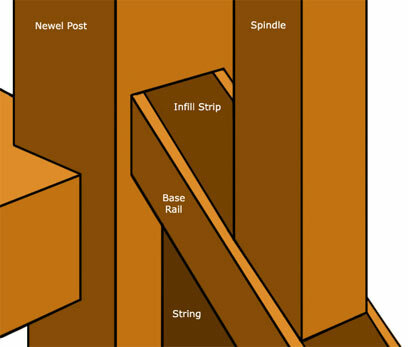 A half newel is where the handrail ends at a wall and only half the newel might be used to give the impression that the newel is embedded into the wall. These are the strips that fit into the groove in the base rail between the spindles. They are decorative to hide the groove in the base rail. These are hand rails that are attached to the wall, what then to the stairs through the newel. They do not have spindles and are fixed to the wall with wall rail brackets. 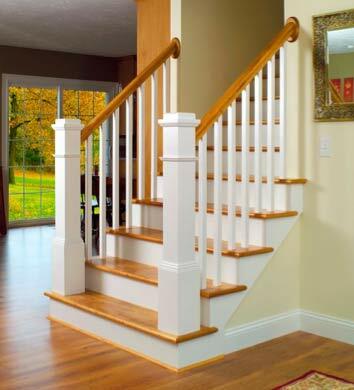 The spindles (or balusters in North America) are the thin supports between the base rail or tread of the step and the hand rail. As we have mentioned before, they are not structural and do not hold up the handrail, but will offer a little support and they are to stop people falling through the gap below the handrail. 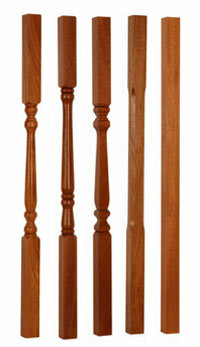 Spindles are typically wood and they are turned on a lathe to achieve perfectly round cuts on. These can get fairly ornate depending on the style you are trying to achieve and your budget. Typically spindles come in two lengths when bought ‘ready made’, 900mm and 1100mm, but can be made to any length that if required. They tend to be between 32mm and 41mm wide, but again can be made especially outside these sizes. Type of wood – The most common choices are Oak (either English of American), Ash and Pine, particularly if they will be painted. There are a great many other woods that are used so it is worth shopping around to find the wood you like. Design – At the simplest, wooden spindles can be square, but even these can be enhanced with chamfers. Turned spindles can vary considerably from the delicate Edwardian styles to the heavier traditional styles and the Victorian styles. 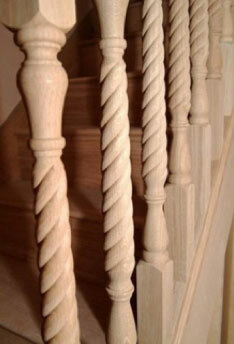 At the most complex there are twisted spindles, which are also known as barley twist spindles. Fluting can also be added to the turned spindles. 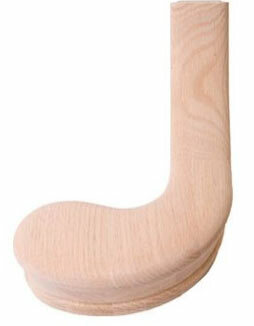 Flutes are grooves that are routed into the spindle for decorative purposes. 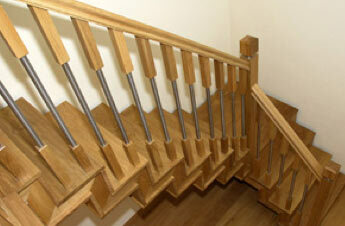 These can be added to a staircase in a contemporary home. They can be used to create a dramatic industrial or gothic feel, depending on the style or a more modern touch if more simplistic. It is possible to get chrome or brushed metal spindles if you want an even more dramatic effect. Mixing metal with wood in the spindle can also be very effective. You can dispense with the spindles altogether and have panelling. The most contemporary type of panelling is glass. In this country most stairs are purchased pre-made by a manufacturer in a factory. They are then assembled on site, which makes the build of the stairs much quicker and easier. This also ensures that they are constructed properly. 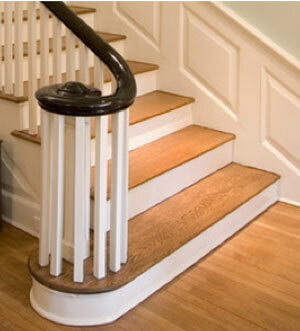 We go in to more details about stair cases in our project about the staircases that is mentioned above. Even if your stairs are constructed off site and only assembled in situ, it is important to have the knowledge of how they fit together and what all the different parts are. This way you will be able to choose the designs that you want – as you can see, in the balustrade alone there are a huge amount of options that you have to choose from.